Some life events are just hard to get over. Like, riding in a canoe for the first time with your husband who thinks faster is better and rapids are fun. And yes, that stinkin’ canoe tipped. I ended up in that cold, Michigan river. For a minute. I say a minute because the current was moving fast, and was very cold, and I might have actually walked on water that time while trying to scramble up onto the shore. You know, when we went into the little clapboard shack to rent our canoes, I noticed a t-shirt that had a figure of a man standing in water with a broken canoe over his head. I should have known then…you think? So, how do some writers (like me) deal with such traumatic times in their lives? Well, they put it in a book. And that’s how I came about the opening scene in my newest Madison Creek story: Season’s End. Except, I had nowhere to go, like Haley, and I had to get back into that infernal death trap and finish the ride. And here’s the worst part, nobody would get me one of those shirts! I so thought I deserved one. My husband, however, was still a little put out that I’d left him to deal with the capsized canoe and retrieving our cooler and paddles. Yeah, well…that was beside the point. If you’d like to check out a sneak peek at Season’s End, and this truth-is-stranger-than-fiction scene, you can CLICK HERE. I had a good laugh writing it and think you’ll have one reading it. 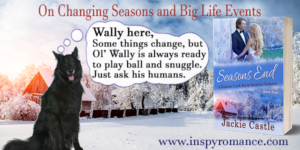 Here’s something else… Season’s End is more than just another Madison Creek romance… it’s also my TWENTIETH book! I guess that’s where the title for this latest book came from… changing times and changing seasons. Maybe that’s one of the reasons why we have seasons. It’s Gods way of telling us to hang in there through the bad weather times because it’ll change and you’ll experience something new before you know it. I’m grateful for that. How about you? Do you embrace or shy away from change? Do you have a season that’s your favorite? I love, love, love, fall and spring the best. They are beautiful seasons that are both full of color and inspiration. I’m having a little celebration next Tuesday, October 23 from 4-9pm (CST) over on Facebook. The theme is Celebrating Small Town America. I’ve invited a few of my sweet romance author friends to come and hang out. They’ll also be talking about their love for setting stories in these little, often forgotten, towns across our great states. You can join in the fun, discussion, games and prizes by CLICKING HERE. I truly hope to see you there. Hi Jackie, congratulations on 20 books:) Hehe, I had a very similar experience white water rafting- I got tossed in at the start of the run and had to get back in and finish until the end; I should note that I have not white water rafted since!! I don’t mind change- so long as it makes sense! My favourite season is definitely autumn- warm days, cool nights and rarely do we get strong winds like in spring! Oh boy, there’s a rafting story too. Same characters…meaning my husband… are involved. But that’s for another time. Ha! Autumn is such a beautiful season, isn’t it? I’m loving the crisp morning and it’s finally sunny after a week of rain down here in Texas. Wonderful! Hi Jackie! Congratulations on 20 books. As a Michigander, I enjoy your Madison Creek romances. I am not fond of canoes, since I am a non swimmer. In fall Michigan waters are frigid. In 2002 almost got tipped in a canoe in Germany when our canoe was attacked by a swan. That was my last time in a canoe. Saturday we had quite a Michigan storm with high winds, rain, sleet, waves on the lake were over 10 feet. A pine tree fell on our neighbor’s house and thousands of people were without power including our son. This small town gal, is looking forward to Celebrating Small Town America with you and the fabulous group of authors on Tuesday. Best wishes. Oh man, I’d heard there was a bit of snow and sleet going through Mi. Glad to hear you’re okay. And glad to hear you’ll be joining my party. YaY!! Good morning, Jackie! I am so sorry I laughed while reading about your canoe adventure….but kudos on actually doing it! I am a chicken and would have probably never gotten in it to begin with!! Ha! No need to apologize. I wrote it hoping for a few chuckles. I’ve wised up to my husband’s antics over the years and proceed with more caution than I did in our early years. lol. But he’s a good’un and keeps life interesting. I almost never seek out change but, I have to admit, after it’s happened it is usually not as bad as I thought it would be and sometimes even better. My favorite season is summer because I love, love, love the hot, sunny weather. I get it, I usually go kicking and screaming at first, too. Then when I finally open my eyes I realize it isn’t so bad, too. My husband loves the summer, but he’s from Michigan, so I guess I get it. Sorta. lol. I’m with you, preferring the shoulder seasons. We are having glorious fall weather in SE BC right now. The frosts are heavy at night, the fall foliage is bright on the mountains and in the orchards, and the sky is clear autumnal blue. Daytimes this week have been T-shirt weather. It’s absolutely perfect! Now that I don’t have a day job in town, I really like winter. I love the snow and the crisp weather. I just hate driving in it! Summer is too hot. I find it hard to do more than exist through those months. That’s how our Texas summers are. You race from AC to AC and try not to melt in between. I just try to wait it out and save the fun stuff for Fall, Winter and Spring. Congratulations on 20 books! That’s awesome. :) I can relate to your canoe story, but mine was white water rafting. Can’t say I’m a fan! But the guys were loving it. We didn’t tip or fall out, but water, very cold water, got in the raft and kind of the same scenario as you. Cold, wet, not happy. I love that you used this to inspire a scene. As far as change, I’m okay with it. I actually embrace change. Not sure what that says about me. :) And I love spring—newness and everything coming to life. I love spring, too, though spring means work getting the yard plants going again. ha. Funny, there are several women who’ve had similar canoeing/ rafting experiences… but the guys seem to have a blast. Go figure. I don’t like change usually. We’ve had a lot over the last year moving from our home of 30 years to a new state to be near our kids who had all settled in Kentucky and Nashville. We’re enjoying our new home and life as we figure out how things work here. My husband and I both went on the same church trip rafting as young single adults before we met. We both fell in the rapids from different rafts and have never gone again! I bet Kentucky and Nashville are beautiful this time of year! A little secret about our canoe trip, the river was moving kind of fast, but there weren’t any big rapids. We tipped because I couldn’t get the canoe away from a fallen tree in time and we got hung up. lol. That might be another reason husband was a little put out with me. ha! My goodness, Jackie. I’m impressed with how prolific you are. 20 books in 5 years. Wow!!!! Hehe…what a great canoe story :) Glad that you can use it in a book! Ha, me too. You’d be surprised how many crazy personal experiences end up in my books. Just saying. lol.